Free Form™ Habitat™ Flex FR Product Information | Smooth-On, Inc. Specific Volume 17.9 cu. in./lb. 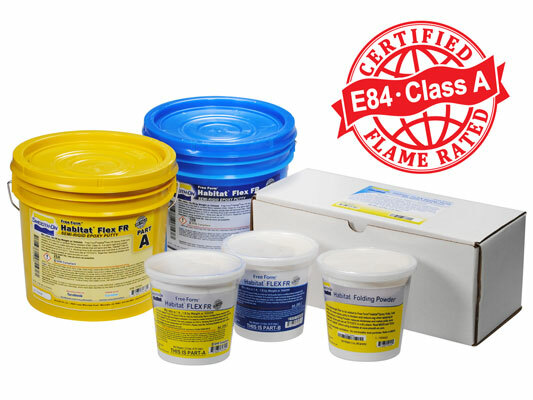 Free Form™ Habitat™ Flex FR Epoxy Putty is a mix-and-apply-by-hand putty that is that is certified flame resistant (E84, Class A) and is used to create display elements that are semi-rigid and extremely tough. Habitat™ Flex FR is solvent free and contains no VOC’s. Working time is 90 minutes and handling time is 24 hours at room temperature (73°F/23°C). Cured epoxy has some flexibility with excellent impact resistance and abrasion resistance. Use with or without Habitat™ Folding Powder™ – mix equal parts A+B and apply Habitat™ Flex FR. 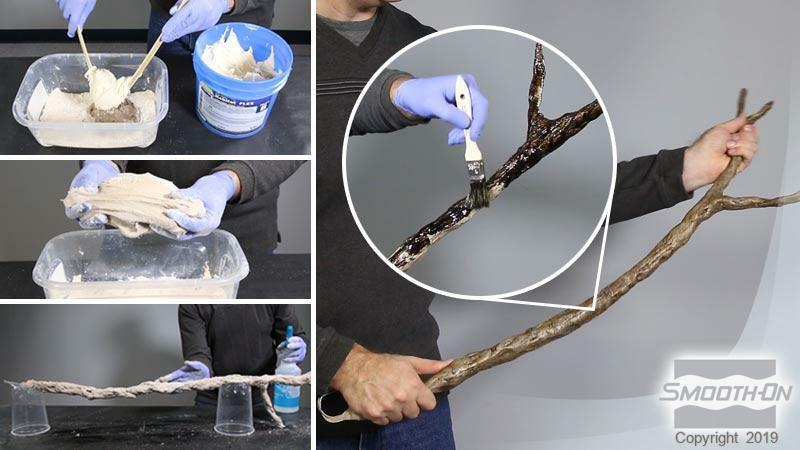 For thickening, add Folding Powder™ into epoxy putty. Folding Powder™ reduces stickiness and makes the epoxy more handleable. Once putty is applied, it can be stamped with a silicone rubber stamp to create repeating patterns with intricate detail over a large surface area. Surface can be smoothed with alcohol or water. New Habitat™ Flex FR will bond to cured Habitat™ Flex FR without delamination. Habitat™ Flex FR will bond to a variety of surfaces including foam, steel and stainless steel, wood, PVC, ABS plastic, concrete and more. It is easy to paint with acrylic paints or stains. Use to make perfectly detailed tree branches, vines, planks and other themed elements for zoos and amusement parks. 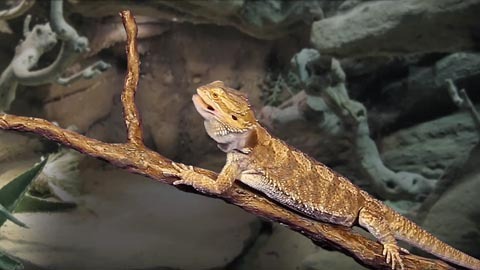 Because finished elements are semi-rigid, reptiles and birds can comfortably grip them without affecting the material. Rate Of Coverage - Assuming a thickness of 0.25 in. (6.3 mm), 1 lb. (454 g) of Free Form™ Habitat™ Flex FR will cover approximately 71.6 in2 (462 cm2). The following table indicates coverage rate per size of Habitat™ Flex FR packaging. Preparation – Materials should be stored and used at room temperature (73°F/23°C). This product has a limited shelf life and should be used as soon as possible. Mixing should be done in a well-ventilated area. Wear safety glasses, long sleeves and rubber gloves to minimize contamination risk. Before mixing materials, apply Folding Powder™ to work surface in a 1/4” (6.3 mm) layer. Powder gloves with Folding Powder™ to eliminate sticking. Because no two applications are quite the same, a small test application to determine suitability for your project is recommended if performance of this material is in question. Applying A Release Agent – This product is adhesive and will bond to many surfaces. Where adhesion is not desired, a thorough application of Ease Release™ 200 release agent (available from Smooth-On) is recommended. Measuring - Free Form™ Habitat™ Flex FR comes as two parts. Dispense equal amounts of Part A and Part B. These products have a limited shelf life and should be used as soon as possible. CURING - Habitat™ Flex FR can be handled after 24 hours at room temperature. Full physical properties are reached in 7 days. In most cases, material will have a slight “tack” for up to 48 hours. Painting – Cured Free Form™ Habitat™ Flex FR can be primed and then painted with acrylic enamel paints. Let paint fully dry before putting part into service. 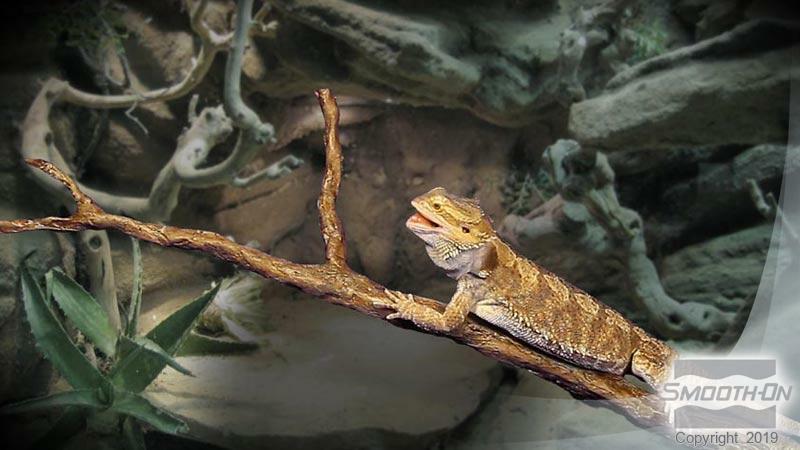 Removing Uncured Free Form™ Habitat™ Flex FR - Remove as much uncured material from the surface as possible. Clean any residue with soap and water. Optional - Use E-POX-EE KLEENER™ available from Smooth-On. 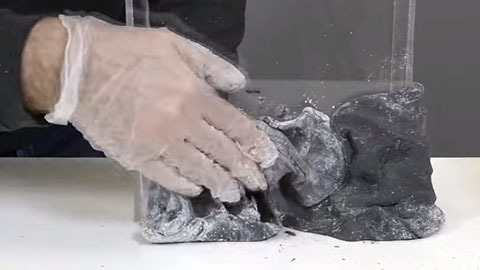 This video how-to demonstration shows how to properly combine Folding Powder into Free Form™ Habitat™ Epoxy. 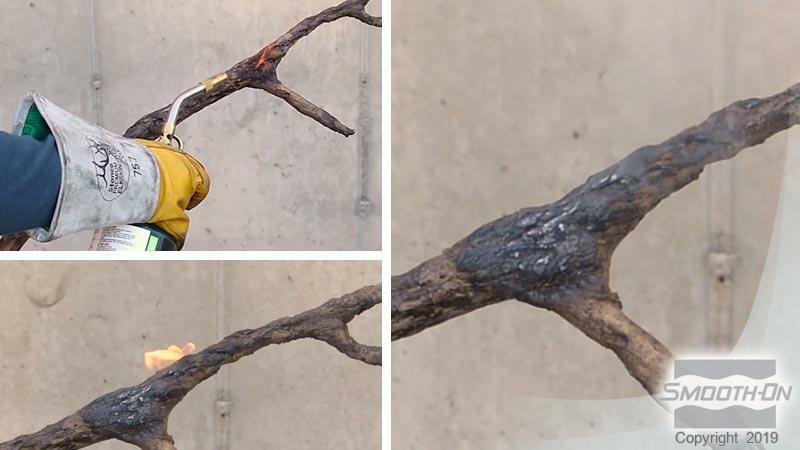 This video shows how Habitat® Flex FR is used to make a realistic tree branch for theming or zoo applications.